​Position yourself as a leader within the private security profession as a Certified Basic Gangology Specialist (CBGS) and be the first in your company to get certified. In the 2011 National Gang Threat Assessment estimated 33,000 gangs representing some 1.4 million “documented” gang members reported by law enforcement agencies in the United States. That number is up from approximately 1.0 million representing some 20,000 gangs in 2009. Gangs can be identified in all 50 states and D.C. with a national average of 48% of all violent crime being attributed to criminal street gangs with that percentage reaching as high as 90% in several cities nationwide. ​Larger OMGs have established new chapters and have attracted many new members. The surge in membership has incited clashes for geographic dominance, which has created higher levels of violence. OMGs continue to engage in all types of violent crimes to include: weapons possession, threats and intimidation, assault, arson, extortion, and drug trafficking. In today's volatile world where law enforcement are being hunted down, ambushed and executed; we are seeing groups like the New Black Panther Party calling for attacks on law enforcement and street gangs issuing direct threats to law enforcement around the nation. Being a Gang Specialist is no longer a speciality unit or position. All officers are now required to become gang specialist to be able to identify a potential gang threat in real time - are you prepared? Is your agency prepared? In the 2015 National Gang Threat Report, one third (1/3) of the jurisdictions report an increase in threats to law enforcement and "the attacks that were carried out against law enforcement and judicial officials over the past two years were violent and brazen." The Gangology Specialist Online Certification focuses on developing the student’s level of knowledge pertaining to street gang evolution, gang crime law, gang identification, communications, typology, personal safety, and the psychological and sociological impact street gangs have on society, as well as officer and public safety. Your "Certified Basic Gangology Specialist" Designation awaits you! This course is appropriate for all areas of private security. This is an incredible opportunity never available before to bring additional value to your professional capital that can be an asset to your hire-ability or better position yourself for that special assignment detail or promotion. The exam is conducted online from the comfort of your home or office and will be a mixture of true/false, multiple choice and scenario driven questions. You must past the final exam with a 90% to receive your CBGS designation. IMPORTANT: This certification course will fill up so we always recommend that you enroll in the date you are most interested in as soon as possible to ensure you do not miss your spot. Brief Gang History, Migration & Evolution in the U.S. Gang Communications: Signs, Symbols, Tattoos, Codes, etc. WANT TO TAKE YOUR TRAINING EVEN FURTHER? Make sure to ask about sending your entire unit through the Certification. SPECIAL CERTIFICATIONS: Based on employment, requirements, and credentials; special certifications can be issued. Contact GFORCE Command for more information. CUSTOMIZED TRAINING: We do offer customized training for your agency's specific needs. Please contact GFORCE Command for additional information. Once approved by the agency, there will be no refunds for the agreed upon course. ​To become certified, you must not only meet each individual certification’s requirements, you must also uphold The Gang Enforcement Professional’s Code of Ethics. 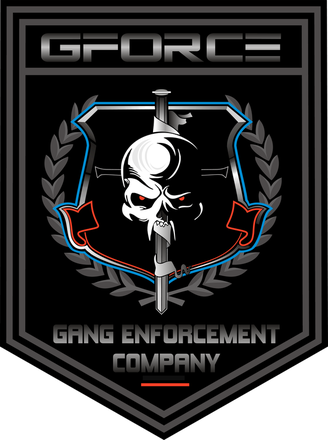 The Gang Enforcement Company™ helps students advance their expertise and careers in the areas of gang enforcement, corrections, juvenile justice, intelligence, extremism, and terrorism at the international, national and local levels. ​Our students benefit not only from our subject matter experts, thought leaders and guest lecturers, but also from the many professional and social activities which the Company organizes in order to enhance each participant's experience. Call GFORCE Command at 321.279.5727 if you have questions.